Teenage Mutant Ninja Turtles TMNT. Nickelodeon Funko. Cool for the collector, fun to play with for kids. If your a collector this action vinyl looks really kool and it looks amazing displayed. For the kid break open the box and you can start playing with one of your favorites from teen age mutant ninja turtles. Loyal Subjects Nickelodeon Teenage Mutant Ninja Turtles Wave 2 3" TMNT Toy. Condition is New. Shipped with USPS Priority Mail. Your favorite heroes in half-shell are the newest additions to the Pop! 8-Bit series. Funko is excited to introduce Leonardo, Donatello, Raphael, and Michelangelo as stylized 8-Bit vinyl figures! Leonardo stands approximately 3 ¾ inches tall and is packaged inside a window display box. Recommended Minimum Age: 3 years - not suitable for children under 3 years. Loyal Subjects TMNT Teenage Mutant Ninja Turtles Lot of 10 NEW Figures w/cards! 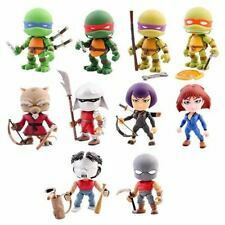 The Loyal Subjects -Teenage Mutant Ninja Turtles Lot of 10 NEW ! New with sealed weapons. 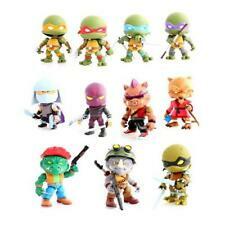 This is the Loyal Subjects Teenage Mutant Ninja Turtles Series 1 Blind Box line. They're awesome! The Loyal Subjects makes some of the coolest vinyl figures on the planet and the Teenage Mutant Ninja Turtles lineup is no exception. They are 3 inches tall and feature 9 points of articulation. Very cool for an urban vinyl figure. Weapon accessories and collector cards, these little guys are collector made and inspired. Please Note: Each quantity purchased is 1 random figure in 1 blind mystery figure box. Recommended Age: 15 Condition: Brand New and Sealed Dimensions: 3" X 1 Loyal Subjects Teenage Mutant Ninja Turtles Blind Vinyl Figure. Blue Ranger Mighty Morphin Power Rangers The Movie Loyal Subjects Action Vinyls. Condition is New but opened. Shipped with USPS First Class Package. See Pictures! Boxes opened and discarded. 2017 The Loyal Subjects Teenage Mutant Ninja Turtles W.2"Bebop (2/12)". The item is in. Would look great on a desk or shelf for display in a man/woman cave, office, playroom, as desk or computer decoration, etc.Always a conversation piece! Played with condition. I think there is at least one dated 1992. The two in the bag have accessories. They range in size from 4" - 10". I'm not certain all of them are TMNT. 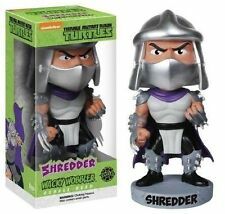 Up for sale is thisLoyal Subjects Wave 1 TMNT Shredder with accessories. NO EXCEPTIONS. There is no need to request one we do it automatically. Available for purchase is One Full Case of 24 Blind Box Teenage Mutant Ninja Turtles Vinyl Keychain Series by Kidrobot. Case will include 24 random figures. You are NOT guaranteed to get a complete set and will receive duplicates. Kidrobot is back with a brand new Teenage Mutant Ninja Turtles Keychain Series! This series is TOTALLY TUBULAR with a cast of wacky villains and heroes from the original ‘80’s series. Each key chain comes with a clasp that can be detached and used as a zipper pull. Keychain figure height size is about 2" and comes brand new in an unopened blind box!!. I am not a professional grader, so see the pics, and you be the judge! 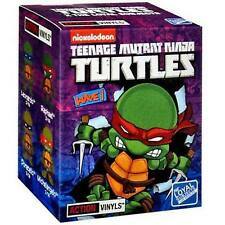 The Loyal Subjects Teenage Mutant Ninja Turtles Wave 2 Bebop Action Vinyl . Condition is New. Shipped with USPS First Class Package. 2017 The Loyal Subjects Teenage Mutant Ninja Turtles W.1"Leonardo (2/16)". The item is in. Would look great on a desk or shelf for display in a man/woman cave, office, playroom, as desk or computer decoration, etc.Always a conversation piece! Does not include card. See pictures for more details. Like what you see?. Each Hikari will include a hand numbered card to prove authenticity and rarity. This Raphael Turtle Hikari is limited to only 3000 pieces worldwide. Cowabunga, dude! Toynk was started in the fall of 2001. Any imperfections like scuffs, marks or stray paint are factory errors. This is a Kidrobot Teenage Mutant Ninja Turtles 7 Inch Leonardo Vinyl Figure that's produced by the neat folks over at Kidrobot. It's awesome! Leonardo stands roughly 7 inches tall and he's featured in a neat, solid blue colorway. Great for any fan of Kidrobot collectibles and TMNT. Recommended Ages: 14 Condition: Brand New Dimensions: 7"X 1 Kidrobot Teenage Mutant Ninja Turtles 7 Inch Leonardo Vinyl Figure. This is a Kidrobot Teenage Mutant Ninja Turtles 7 Inch Raphael Vinyl Figure that's produced by the neat folks over at Kidrobot. It's awesome! Raphael stands roughly 7 inches tall and he's featured in a neat, solid red colorway. Great for any fan of Kidrobot collectibles and TMNT. Recommended Ages: 14 Condition: Brand New Dimensions: 7"X 1 Kidrobot Teenage Mutant Ninja Turtles 7 Inch Raphael Vinyl Figure. Authentic and detailed fully realized likeness as seen in Teenage Mutant Ninja Turtles (2014). Body with over 25 points of articulation. Interchangeable hands. Two (2) Nunchucks. CHOKING HAZARD SMALL PARTS. You are looking at a 2015 Teenage Mutant Ninja Turtles Michaelangelo metallic vinyl figure from The Loyal Subjects Limited Edition Metallic set that is 2/12 boxes. The item is new and was only opened for identification purposes. The figure will be shipped with the opened box, sealed weapons/accessories, card, and original packaging. The figure comes from a smoke free home and I do combine shipping costs within the US. Shipping within the US with tracking is $3.50. This is a Best Offer listing for a complete set of Funko's TMNT Mystery Minis (12 figures total). Please see all pictures. These were opened to reveal the character. Items come from a smoke and pet free home. Be sure to check all my other items for sale. Buy with confidence! Diamond Select Toys Teenage Mutant Ninja Turtles Raphael Vinyl Bust Bank NEW! We are grateful for your interest in Batcave Treasures! A Diamond Select Toys Release. A new line of TMNT banks from Diamond Select. We are top rated for a reason! Which of course is FRAUD and theft.